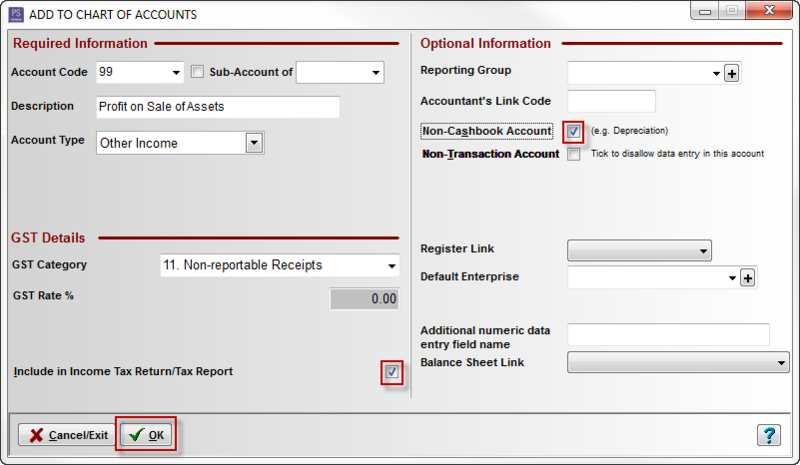 How do I add and setup asset groups correctly in the Fixed Asset Register? Before you can add an Asset Group to the Fixed Asset Register it is advisable to add all accounts needed for Asset Group setup. 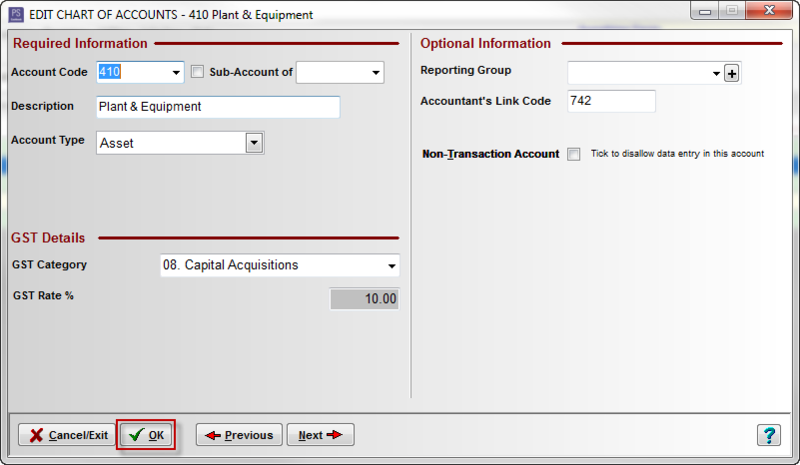 For this example we will setup the accounts needed for the Asset Group Plant & Equipment. Click on the Chart toolbar icon. Click on the Expense tab. If you have more than one type of Asset Group, it may be worth creating Depreciation sub-accounts. 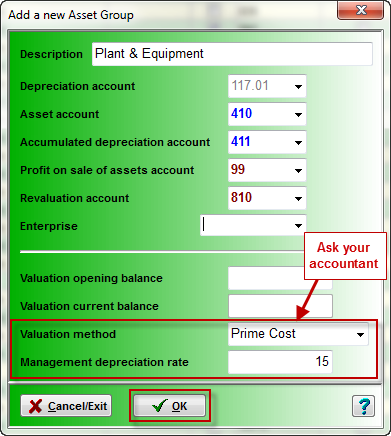 For this example we will create a Depreciation expense account for Plant & Equipment. Tick Sub-Account of check box. Tick the Non-Cashbook Account (e.g. Depreciation) check box. Other Depreciation expense accounts can be set up at the same time. Click on the Assets tab. For this example we will create a Asset account for Plant & Equipment. For this example we will create an Accumulated Depreciation account for Plant & Equipment. Other Asset and associated Accumulated Depreciation accounts can be set up at the same time. Click on the Income tab. Tick the Include in Income Tax Return/Tax Report check box. Click on the Equity tab. 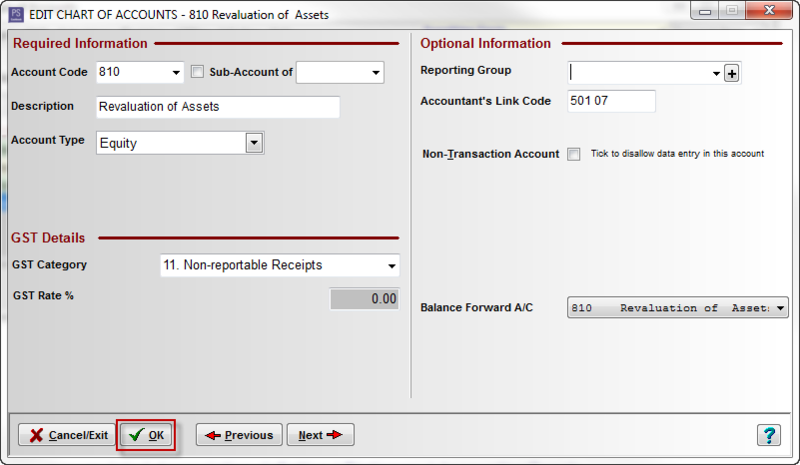 Click on the Registers > Fixed Assets menu option. Click on the Groups ... button. For this example we will Add the new Asset Group Plant & Equipment. Note: There are two Valuation Methods you can use to calculate asset depreciation. Prime Cost - used to depreciated assets by equal amounts each year over its effective life. Click on the following ATO website link: https://www.ato.gov.au/business/depreciation-and-capital-expenses-and-allowances/general-depreciation-rules---capital-allowances/prime-cost-(straight-line)-and-diminishing-value-methods/ for further information. Note: It is strongly advised you contact your accountant for help in which method you should use and what depreciation rate to allocate to each asset group. Your accountant can look at how your business operates to determine which method is appropriate. Also consult your accountant as to when to depreciate your assets, e.g. at the end of the financial year. Repeat this process of allocation for each asset group you add. Click on the following link to Add Assets to the Fixed Asset Register.